Want a home theatre, but not allowed to fill your front room with speakers? Q Acoustics is a British brand with a unique speaker solution for film fans who want home cinema sound, without, necessarily, the home cinema. Its Q-AV system delivers 5.1 surround from speakers that blend almost invisibly into the room. Jack Bauer might call this 'hiding in plain view', and I think it's very clever. The front three satellites are cunningly disguised as the TV's own speaker system and are held on an ingenious metal frame that can be adjusted to precisely the width of any 32 to 50in TV. They use flat BMR (Balanced Mode Radiator) drive units so that you can adjust the depth too. With the three speakers mounted in place, you simply stretch over the elastic fabric grill to hide the framework and complete the illusion. There's a magnetic badge included to attach to the front, although this does tend to give the game away. If you don't want the rears, Q Acoustics will supply a 3.1 package, which simply includes the front three plus a subwoofer. The Q-AV sub packs a 120W amplifier and 8in bass driver inside a narrow cabinet that has been designed to minimise floorspace by hugging the wall. To that end, it comes supplied with a wall bracket. The unusual low-profile design and white paint job (black is also available) makes the sub effectively look a bit like a heater or air con unit, adding to the overall invisibility of this system. Finally, the Q-AV rears, which use the same flat-driver technology as the fronts, are supplied as wall-mountable surround speakers. They also have a prop for standing on the floor and a curved back, which allows them to fit flush with either the skirting board or coving depending on whether you are installing them high or low. I found that the dispersive nature of the BMR drivers mean that positioning is rather less fussy than with regular rear speakers. In a show of faith, Q Acoustics even promote the concept that the Q-AV rears can be used as a stereo pair for a hi-fi. This is a bit of a leap. They are not exactly full-range, but the sound quality is remarkably proficient on the end of a decent sound system. If space is an issue - perhaps in a bedroom - they certainly provide a practical solution. In a 5.1 surround sound setup like this, the five speakers are voice-matched with the same drive units all the way around, while the sub picks up the bass frequencies from a 120Hz and below. The relatively high crossover point takes the strain off the satellites, but you'll need to get the volume level just right on the subwoofer to achieve a cohesive sound and avoid a disembodied bass. Setting up the Q-AV system takes longer than usual if you want to get the front three speakers mounted flush with your TV, but it's worth the effort. The LCR unit slides smoothly into position and locks tight with an Allen key. The frame can then be screwed to the wall below your flatpanel TV using a cardboard template included in the box as a guide. Q Acoustics also sells a metal-frame TV stand that holds everything if you prefer not to wall mount. With everything in place and cables neatly tacked away, the Q-AV system does seem to melt into the décor of the room. The LCR unit looks not unlike a Yamaha or Boston Accoustics soundbar, but the concept is quite different - as is the result. The fronts manage to lock the dialogue to the screen, but also throw the soundstage wide open, thanks to the broad radiation of the hybrid NXT drivers. The rear speakers do a similar job behind to create a truly enveloping sound quite unlike even the best soundbars. The soundstage that can be created from this sneaky system is startling. Despite their shallow proportions, these BMR drivers can throw out a rich and dynamic movie soundtrack. Cueing up the Pirates of the Caribbean: Dead Man's Chest Blu-ray to one of the rowdy battle scenes and edging the volume up on my Denon AVR-A11SR pushes the speakers hard, but doesn't overstretch them even at neighbour-bothering reference levels. The soundstage feels full, vibrant and cohesive on all sides. Due to the high crossover point, the subwoofer is doing a lot of the work here, but if you get the level right, the cannon fire appears to be emanating from the screen toward you exactly as intended. Turn the woofer up too much and you loose some of the illusion. With the L, C and R channels in such close proximity to the screen, there is some localisation at the front and a slight narrowing of the stereo image. You wouldn't usually put three speakers so close together, but with these BMR drivers, it's less of an issue. Their soundwaves are dispersed at an almost 180° angle, unlike the more directional nature of conventional speaker cones, so there is no specific sweet spot - or rather a much larger one. The BMR panels are particularly good at conveying treble detail too, which helps in delivering quietly-spoken dialogue from the centre channel. Subdued soundtracks like David Attenborough's Earth fare just as well as the crash-bang-wallop variety, thanks to the sensitivity and dynamic nature of the Q speakers. Musical playback is not the primary objective of this system, but it can still carry a tune in stereo mode. There's plenty of crisp treble, snappy bass and an open and airy mid-range that reveals nuances in my Nick Drake Treasury album. What these speakers can't do quite so well as equally-priced freestanders is stereo imaging. Closing my eyes I couldn't quite picture Nick Drake strumming in front of me. Q Acoustics has identified a place in the market. 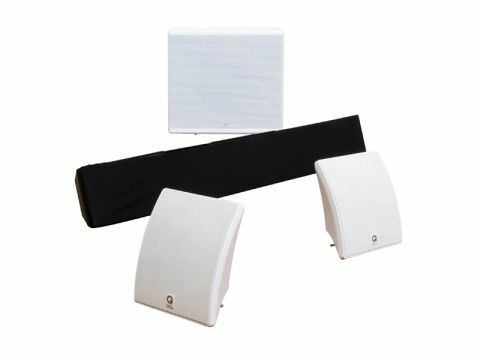 Its Q-AV system does a good job in delivering cinema sound from a speaker system that's almost invisible. Innovative drive unit technology plus innovative, practical design equals an entertaining sonic experience. If you're not allowed to fill your living room with speakers, this cunning setup is a convincing alternative.